You can’t put a price on culture. Or can you? Danny Meyer is a renowned New York City restauranteur and the CEO and founder of Union Square Hospitality Group. He believes success in any business is based on culture. 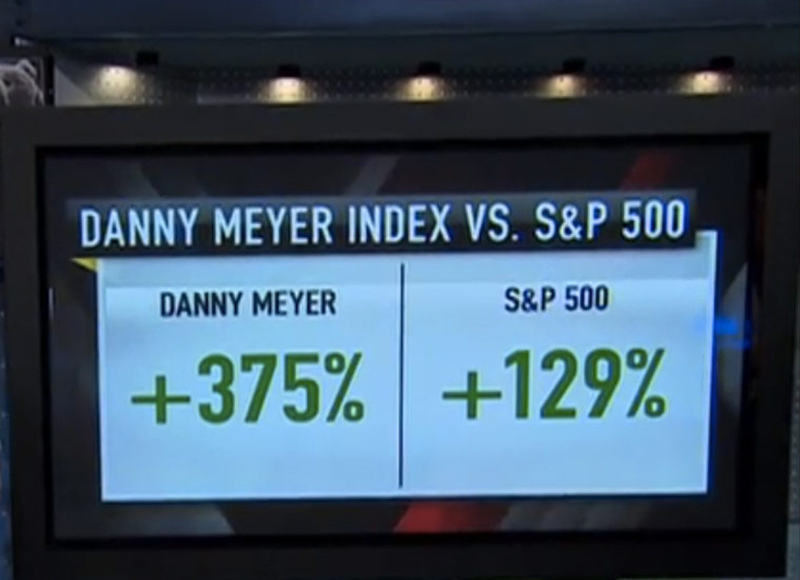 In 2009 Meyer appeared on Jim Cramer’s show Mad Money. You can’t put a price on culture. Or can you? Danny Meyer is a renowned New York City restauranteur and the CEO and founder of Union Square Hospitality Group. He believes success in any business is based on culture. In 2009 Meyer appeared on Jim Cramer’s show Mad Money. On the show, Cramer’s producers surprised him by wheeling out a tray featuring food from various public restaurant companies: a lobster from Red Lobster, a bowl of spaghetti from the Olive Garden, a Big Mac from McDonalds, a steak from Ruth’s Chris Steak House, and a burrito from Chipotle. The idea resonated with the Mad Money host, ultimately sparking what Cramer called the “Danny Meyer Index.” It’s an index of companies, selected by Meyer, all of which understand and leverage the concept of hospitality and culture to its fullest. The index currently contains: Chipotle, Whole Foods, Apple, Amazon, American Express, Nordstrom, eBay, Men’s Wearhouse, Southwest Airlines, Mattel, Google, Bed Bath & Beyond, Costco, Brown-Forman, Goldman Sachs, and Salesforce.com. And it looks like you can put a price on culture. Since its creation in February 2009, the index has generated a 375% gain, crushing the S&P 500, which is up 128% over the same period. Culture is not something you can actually see, yet it is in the environment and experiences your organization creates for its employees, customers, clients, members, and volunteers. To put it simply, it’s how your organization makes people feel and it’s those feelings—whether good or bad—that are very powerful influences. Culture has always been important, but right now it’s crucial because culture really matters to Generation Y (1982-1995), the largest generation in history rapidly moving into positions of leadership and influence. This generation bases their employment and purchasing decisions largely on company culture. Gen Ys have been given the negative label of being entitled, and well—they are. Their expectations are set a little higher and their patience is a little shorter because they have been raised in a world driven by technology and credit cards. They have been given more choices and access than any other generation, so they’ve never had to settle for inadequate, irrelevant, or unhappy and they’re certainly not about to start. The only way your organization will stand a chance at engaging Generation Y is if the organization’s culture is positive, engaging, and service-oriented, thereby making the experience exceptional. Consider Google. From its inception, Google became renowned for having a workplace culture that was truly revolutionary. The company was built on the premise that people want meaningful work, knowledge of what’s happening in their environment, and the opportunity to shape that environment. Success has certainly followed. Google generates $50 billion in revenues and attracts one million job applicants each year, continually earning honors as the best company to work for in the United States, Canada, Japan, India, Korea, Brazil, and elsewhere. Surprisingly, most organizations aren’t paying much attention to culture but instead making decisions based on nothing other than financials and historical performance reports. I recently facilitated a board retreat for a large membership association struggling to engage younger members. Prior to the retreat I asked board members to meet with people between the ages of 18-32 and ask them a list of provided questions. Among the list were these two questions: ‘What has to happen to make you feel like you belong?’ and ‘What one word would you use to describe success?’. When the responses were shared at the retreat, the board members (85% who were Baby Boomers) were shocked to discover that overwhelmingly Gen Ys answered those two questions the exact same way. To feel like they belong Gen Ys must be heard; and they describe success as happiness. That’s all about culture, people. And great culture drives engagement and real monetary returns. In other words, culture is key to your organization’s success. Improve your culture and the money will surely follow.